Welcome to another installment of my latest challenge. . For those of you new to receiving these updates – here's the deal: I've taken on the challenge of completing an epic endurance event with the purpose of raising money to fight Leukemia and Lymphoma. I decided to take up this challenge in honor of my mother-in-law, Margie Griffin, who passed away from leukemia last August, and my friend Stacy Bowman, who is a leukemia survivor. My goal is to raise $7,500 to benefit the Leukemia and Lymphoma society through the Team in Training program. My personal challenge is to complete the Tour of the California Alps, also known as the Death Ride – a one day, 130 mile ride, climbing 15,000 feet, over 5 mountain passes. Our sadistic coaches have stepped up the training regimen over the past few weeks. I’ve complete two grueling rides of 109 and 115 miles respectively. 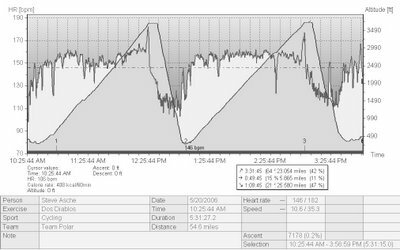 The 115 mile ride was particularly nasty because in addition to 9000 feet of climbing we had a 30mph headwind to fight against on the way back. It made for a long slow day. Last Saturday I rode up Mt. Diablo twice. Mt. Diablo, as its name would suggest, is not for the timid. For those of you unfamiliar with the Bay Area, Mt. Diablo, is a real 3849’ mountain, not a sinister name made up by some misdirected cyclists. Fortunately for me, or unfortunately depending upon how you look at it, the top of Mt. Diablo is 16.3 miles from the end of my driveway. Not a bad way to get in training rides. My goal is to ride it 4 times in one day. That will be a personal best and undoubtedly win me the admiration of the coyotes, squirrels, turkey buzzards, deer, and snakes that will see me several times that day. 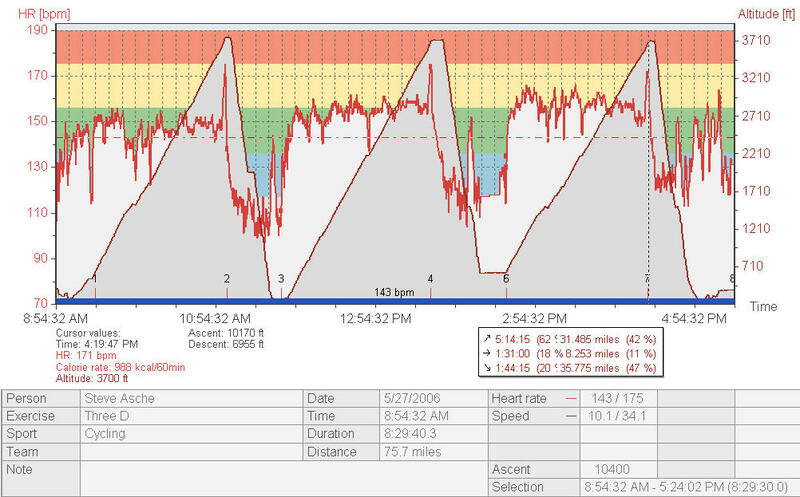 For those of you interested in the effects of riding mountains, check out the image of my Mt. Diablo training ride. You’ll have to go to the blog. 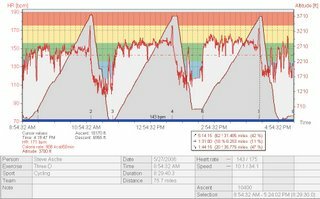 The chart shows the elevation and heart rate over time. At the very top of Mt. Diablo there’s a 1/3 mile section of 17% grade. In other words, it’s really, really steep. At the very top, there’s a large spike in my heart rate. That’s when, much like those cartoon characters that when they get excited their hearts literally pound through their chests, I’m ready to explode. 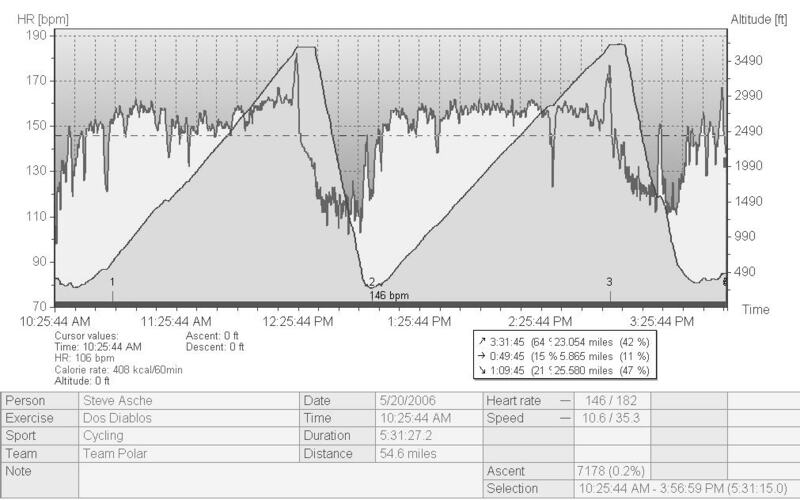 Fortunately I bought a fancy heart rate monitor (HRM) with a built-in defibrillator. That way if my heart does explode, someone will have a nice HRM. Last time I wrote, I was preparing to go in for a discogram. Let me preface this by saying, if your doctor ever offers one of these procedures to you, say “No”. Despite its pleasant sounding name it’s quite the opposite. This was related to me as I was talking with a nurse at the surgical center prior to the procedure. She said, “Discograms are the most painful things we do here.” If she was trying to calm me down, it wasn’t working. They injected me with valium and applied lidocaine to the treatment area – that was more effective than the nurse. I then had to lie calmly on my stomach. The doctor proceeded to insert 4 long needles into the disk tissue between my vertebrae. I know this because he gave me an x-ray picture of the needles stuck into my backbone. Then the fun begins. He injected fluid into each needle one at a time and asks me to describe the pain. Particularly he wants to know where the pain is occurring. Interestingly, though he is affecting the area in my back the pain occurs somewhere else in my body and in some happy instances, every where else. He continues this process until he can recreate the pain that I’ve been having in my back. Once he was able to do that, he can say with certainty that the problem is originating from that specific disc. Well the good news is he determined which disk is causing the problem. The bad news is they’re still not any closer to fixing it. Last update there were several bike riding tips. Of course, unless you went to the blog, you missed the better tips. You can still check them out any time you like. I thought I’d offer a few more. Shift before the hill. This rule becomes more important the steeper the hill. If you wait until you’re on the hill you’ll likely drop your chain and end up t-boned on the top tube of the bicycle. Getting t-boned is the bicycling equivalent of getting a line drive to the groin. It’s the type of experience you’ll do once and know better the next time. Always lie about how much you ride. If someone asks you if you do a lot of riding, always give them a ridiculously low number. The party asking is likely trying to size you up. Cyclists are pretty competitive and though they don’t say it, they’re always looking to ride better than you. If you give them a low number, they’ll think you’re a sub-par rider. Of course, they’ll figure out you lied when you pass them down the road. If you’re going to yell at the driver of a car, make sure you have a quick exit strategy. The driver usually has an unfair advantage since they have the 4000 pound car to push you around. Your 20 pound bike is no match. If you’re going to yell at the driver of a car, yell loud enough for everyone around to hear. Other cyclists will think you’re a weenie if you only mutter your gripe at a driver. Next time I’ll have completed several more hundred mile rides. With the temperature increasing, it should be loads of fun. In the meantime, check out the blog and tell your friends and neighbors to sponsor me.